Dunstan Downs is 17 km from Omarama (small township) We are on State highway 8, 4 hours from Christchurch and 2 hours from Queenstown. Most buses are happy to drop you at the gate. We are a rural destination , far from the city lights. Put Dunstan Downs into your GPS not 1723. 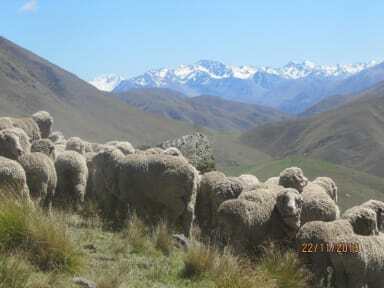 Dunstan Downs is 30,000 acres of tussock covered hills, very scenic country. Guests can go mustering (gathering up the sheep) with a shepherd if they are here at the right time. Linen provided, free laundry facilities. Fully contained kitchen. Dunstan Downs is a working farm, children are welcome. 5 years and under free. Linen is provided in the self contained accommodation. Plenty of parking. 2 Power points for campers and plenty of space to pitch your tent. Great place for cyclists to stay before ascending the Lindis Pass. Excellent fly fishing in the Ahuriri River. The place has an amazing atmosphere, very cosy with great people around. The hosts are very friendly and will get to know their dogs and lambs! The place was clean but the kitchen utensils were very old and the napkins didn't look very clean. Overall it's a good place to stay a couple nights.